Incident Response starts with, "What's your plan?" Does it focus on your Cloud environment? 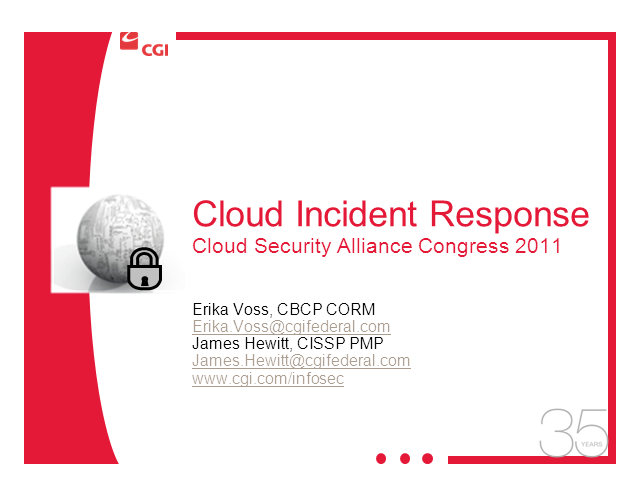 How will you detect, notify, isolate, and contain cloud-based incidents? We focus on developing/ramping-up cloud-specific IRPs. "The Cloud." Where small and large organizations are going and have gone. You want to be in the cloud, but how do you protect it? Incident Response starts with detection. How do you detect what or who is in your cloud? If an incident occurred, would you know? We present a strategic approach to improving IR awareness and detection to meet the cloud's elevated demands. We will help you analyze your IR requirements across the IaaS, SaaS and PaaS platforms, and discuss how to talk with your vendor, risks to management, and IR containment, recovery, and evaluation test procedures.